If you’re looking for a bespoke piece of glass for your Shower or Wetroom Project then look no further. At Bespoke Glass Online, we are able to manufacture 6mm, 8mm, 10mm, and 12mm Toughened Shower glass to your exact size. If you require a piece of glass for a Wetroom in an attic for instance, then most probably will need a cut piece of glass at an angle on a top edge. If you want to create a Single Fixed Shower Panel, then that’s not a problem either. With our Hi-Tech manufacturing process, we are able to provide holes cut and shapes to be made via the CNC water jet cutting machines. All of our Toughened Safety glass comes without question, the edges polished. As crazy as it seems, some of our competitors don’t offer this as standard?? Going Bespoke is a great way to design a wetroom or a shower room without being limited due to an ‘off the shelf’ shower screen Whatever your requirements are, Bespoke glass online can provide a solution. We can accept drawings and cad documents to speed up the manufacture process or if you know exactly what you want, simply use the Online Shower Glass Calculator to create the size, Price and then just pay. Your glass will be delivered within 7-14 days dependant on the queue at Manufacturing. We will keep you informed thorough the whole process and will give you a good idea of delivery times to save you staying in all day on day of delivery. 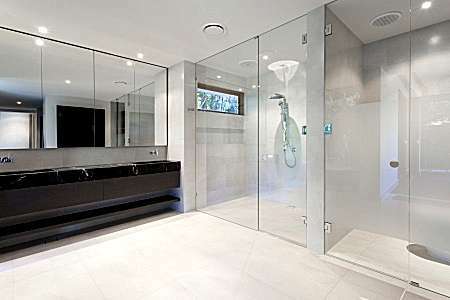 The Shower glass we choose to provide is from world leading glass manufacturer Pilkington, thus providing total shower glass performance and quality that’s expected by our customers. Bespoke Glass offers this service to all customers from Homeowners to Architects and Developers. With a full quoting/ estimation service if required. Don’t Forget, we can also offer you options such as Opaque or sandblasted shower glass or a sandblasted pattern. We also offer options for Ritec or 'clear shield' coatings to help with the self-cleaning on the wet side of the shower glass. 01225 345005 9am-5pm Mon to Fri. Thanks for your easy to use Glass Cutting service, especially your glass calculator that makes pricing a job really easy! Great to find a company that offers real value for money.